What is the best social media marketing tool on the market? This is a question that has sparked many heated debates among marketers. With so many different social media management tools available and their importance to any social media marketer, it can be very difficult to find the right tool for you. 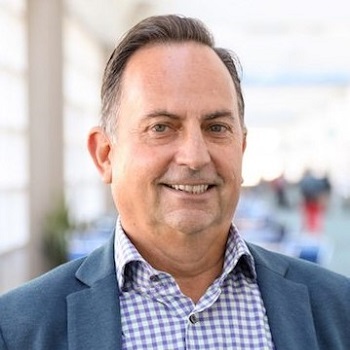 Ian Anderson Gray of the Seriously Social blog has partnered up with G2Crowd to find out which tool amongst the top 5 rated social media management tools on the market is the best. In this post, I will be looking at all of these tools and five others to find out which one is the best. 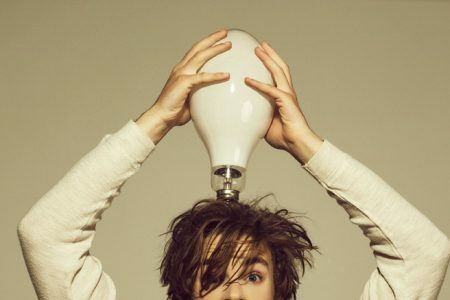 First, let’s look at what makes social media management tools so important to those who use social media for promotional purposes, as well as what features and results most of us need to get out of them. The main things to look for in a social media management tool is if it makes you more productive and efficient. Does it take you less time to manage all of your social accounts? 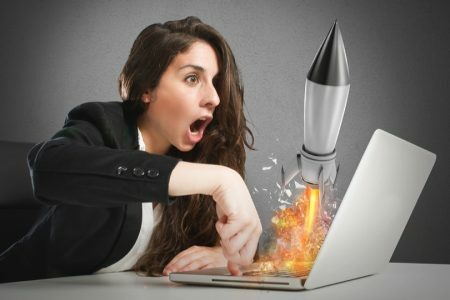 Are you creating better social media campaigns and generally getting better results by using the tool? Is it making the process of managing multiple accounts easier? Multiple accounts: Can you manage multiple social media accounts across all major platforms? Team collaborations features: Can multiple team members work on the same accounts? Can you assign tasks to team-members? Analytics: Do you get detailed analytics reports on your social media activity? Monitoring: Can you monitor keywords, other accounts, hashtags, etc.? Scheduling: Can you schedule posts for when you can’t go online? Product direction: Are the tools keeping up with all the latest trends and changes in social media? Usability: does it improve your productivity? Now, let’s look into each individual tool to see how they fare against each other. According to the infographic’s results, Agorapulse is the best social media marketing tool on the market. I’ve been using it myself for a few years now and I have to say, I agree with the reviews that made up the results from the infographic. So let’s examine this tool first. The Agorapulse dashboard is very straightforward. Switching through all your accounts is easy, as they are all clearly listed on the left hand side of the dashboard. All of its features, such as the social media inbox, monitoring and publishing, are all at the top of the dashboard and easily accessible. One of Agorapulse’s best features in my opinion is the social media inbox, because it makes it very easy to check all of the social media updates that require your attention. It works very much like an email account would – as you go through your inbox and read your notifications and respond to them, the queue grows smaller. You can create automated moderation rules, meaning that Agorapulse will then tag, flag, hide or assign content so that you get all the most relevant messages in your inbox. If you find an update or comment as you go along that you want to save for later review, you can easily add custom tags and categorize them. Another big feature is publishing and scheduling. You can publish posts to any of your networks, as well as schedule them, but the best part is the editorial calendar. Basically, you can schedule all of the updates that you want and see them in a beautiful calendar that makes it so much easier to stay organized and plan your social media updates. Next comes the monitoring tool. You can use it to monitor all of your shares and mentions on social media, find out when someone mentions your Facebook Page, create searches for certain keywords on Twitter and monitor hashtags and places on Instagram. When it comes to reporting, Agorapulse has created some of the most beautiful and detailed analytics reports among social media marketing tools. The reports focus on your audience, engagement and brand awareness – some of the most important metrics, especially to clients. Another really cool thing is that you can see how many posts and comments you’ve reviewed and what your response time and rate are. I think that the feature that sets Agorapulse apart from most other dashboards is the CRM function. This feature makes it very easy to keep track of all of your followers and friends and find out whom your most engaged users are. 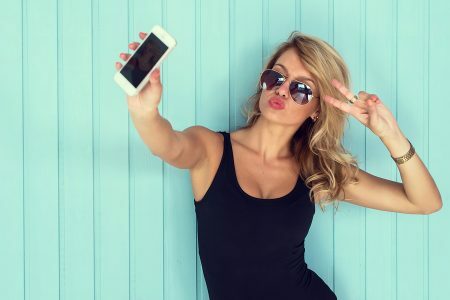 You can also use Agorapulse to find out who your influencers and brand ambassadors are and who among your followers has the most followers themselves. The more followers and friends you have, the more difficult it is to keep track of them, but with Agorapulse you can add custom tags so that you know who is a prospect, who is an influencer and so on. You also can see exactly what you’ve talked about with each user so that you’re never out of the loop. Something else that’s worth mentioning is that the guys and gals of Agorapulse are very quick to respond to new features and changes coming out on various social networks. Conclusion: Overall, Agorapulse is a truly great dashboard and I honestly can’t think of anything that I don’t like about it. The interface is easy to use and all of the features that we’re all usually looking for in a social media marketing tool are all there. Postplanner used to be the tool for scheduling Facebook updates. Now, this is a much more widespread feature, so Postplanner has evolved quite a lot to include more cool features. Its main focus is now on helping marketers increase their engagement on Facebook, Twitter and Pinterest. With Postplanner, you can easily identify the top performing content for any hashtag, topic or social media account, ranked by their virality. With this information, you can more easily come up with updates that will increase your engagement, reach and ultimately your traffic. It’s also a pretty good content curation tool; all you need to do is add your favourite social accounts, blogs, hashtags and keywords to have a list of awesome content that you can easily share, as well as use for inspiration for your future posts. Postplanner helps you decide what the best content is with their star rating, so that whenever you see a post with 4 or 5 stars, you’ll know it stands a better chance of getting you more engagement. The content is also categorized by Photos, Articles and Statuses so you can easily diversify your updates and keep your audience more interested and engaged. 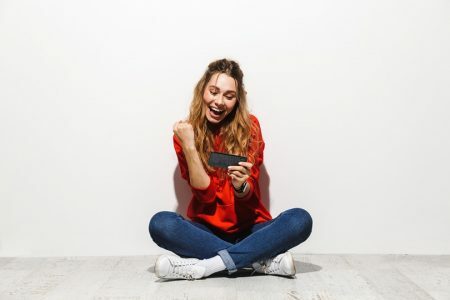 In fact, PostPlanner claim that their features have helped marketers and other users get 650% more engagement than any other of the top social media marketing tools. Scheduling content is also very easy. 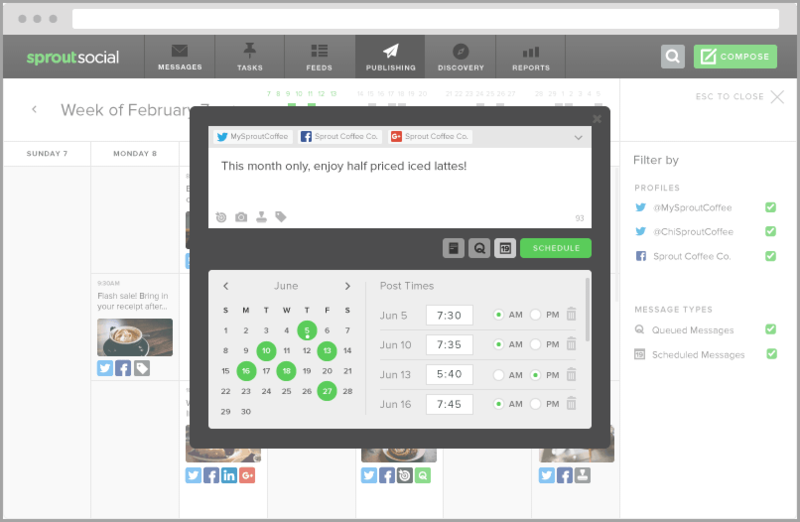 Their Plan feature lets you quickly schedule posts for Facebook and Twitter and arranges them in an easy to use calendar. You can also schedule reoccurring updates and use their cool Re-Cycle feature to revive all of your top updates so that you can make the most out of them. Conclusion: PostPlanner is the perfect tool for those who want to increase their engagement and publish more targeted, engaging content, all from one place. That said, those who want more monitoring and reporting, might have to look elsewhere. Hootsuite is probably the best-known social media marketing tool on the market, but also one of the most criticized. 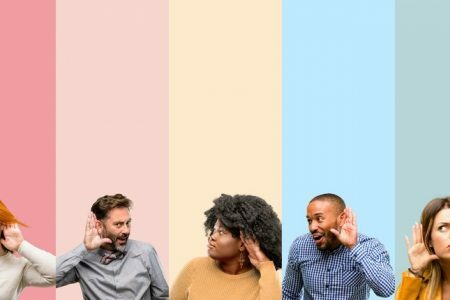 In the beginning, Hootsuite was the answer to all marketers’ prayers; now, though, more and more are sharing their grievances with the popular dashboard, from its add-on analytics to the price of its Pro and business plans as you add more team members. Personally, my least favourite thing about Hootsuite is its interface. Although it’s not complicated per se, it is at times confusing and since there are so many other tools that are much easier to use out there, this is a real problem for me. Another thing that I’m not a big fan of is the Hootsuite Ow.ly link shortener, which you can only track from within Hoosuite. When it comes to some of its features though, Hootsuite are definitely back at the top of the list. You can connect your account to over 35 different social networks, which is definitely not something you’ll see with many other dashboards. Another good feature is monitoring, as you can easily set up streams for monitoring keywords, hashtags, mentions, etc. That said, I’ve sometimes found that it doesn’t get all of the results you’d get if you searched directly on the social network. When it comes to scheduling updates, you can set the date and time yourself or use the AutoSchedule feature that publishes your post at the best time for increased impact. Its reporting feature works with Twitter, Facebook, LinkedIn, Google and Ow.ly. The reports aren’t always that great and you could probably get more information by simply going to your Facebook Insights or Twitter analytics. With the Contacts feature, you can see who is following you and whom you are following. From there, you can follow and unfollow, as well as organize everyone in customizable lists. The Hootsuite Campaigns feature, which is now in Beta, allows you to create contests, sweepstakes and Instagram and Twitter galleries easily. Conclusion: While Hootsuite is still definitely one of the top social media marketing tools, its high prices and its bland, sometimes confusing interface are definitely worth considering before deciding on the perfect tool for you. Sendible is a full feature social media marketing tool that allows you to engage with your audience, schedule updates, monitor social activity and measure your results. It works with Facebook, Twitter, Google+, Pinterest and blogs/publishing websites. You can post updates to any network or multiple networks from the same ‘compose message’ box, similar to Hootsuite’s. 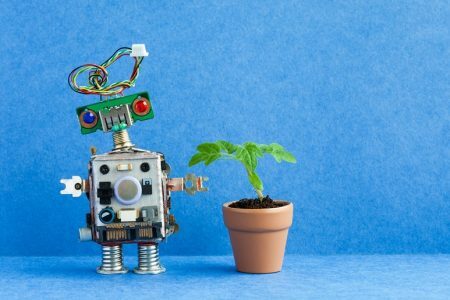 Another similar feature to Hootsuite is how you can select to have your updates published automatically at the times they consider best for boosting engagement and reach. Sendible also has a RSS Auto Posting feature that posts relevant content at regular intervals throughout the day so you’re always providing awesome content for your audience to engage with. 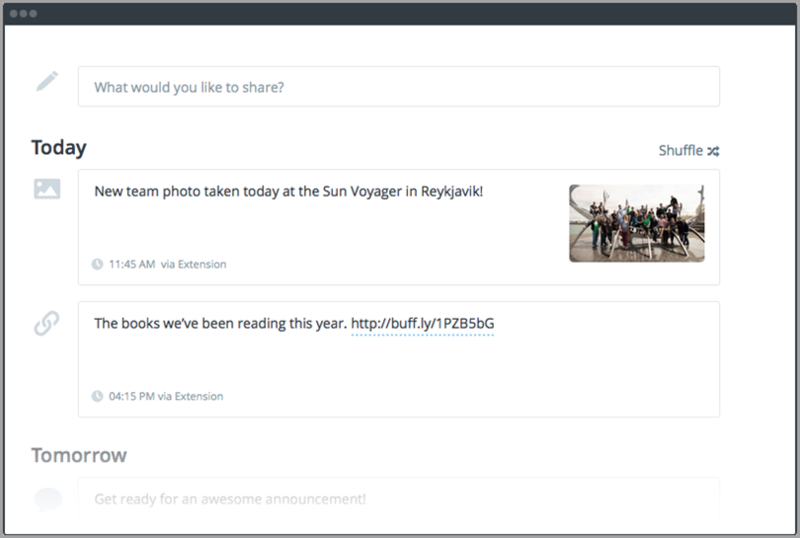 If you have a blog, Sendible will automatically share any new posts to your social networks. There is also a cool calendar where you can oversee all of your team’s publishing activity on social media that you can also easily re-arrange by dragging and dropping updates. Its monitoring feature allows you to keep track of any mentions of your brand, while also creating an automatic sentiment analysis that highlights any messages that need your attention immediately. What’s cool about this is that Sendible doesn’t just find Twitter mentions, but mentions from all around the social web, so that you know everything being said about you online, and the overall sentiment behind it. 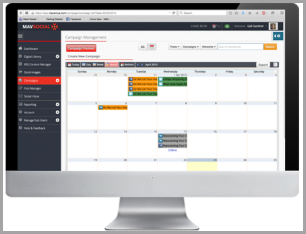 When it comes to CRM, Sendible strives to find you prospects and opportunities. In fact, if you want it to, it can look for prospects and leads constantly and even start conversations for you with the Twitter welcome messages and Twitter auto replies. Another cool feature (just like Agorapulse) is that you can see all past conversations you’ve had with different users that is great for finding new leads and improving connections. You can even import your email lists or create new ones so that you can reach the prospect you’ve found via more traditional marketing channels like e-mail and SMS. 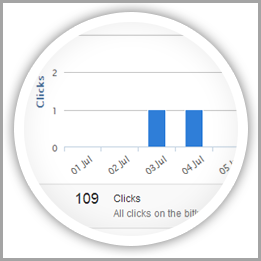 Sendible also provide pretty good analytics that you can customize. 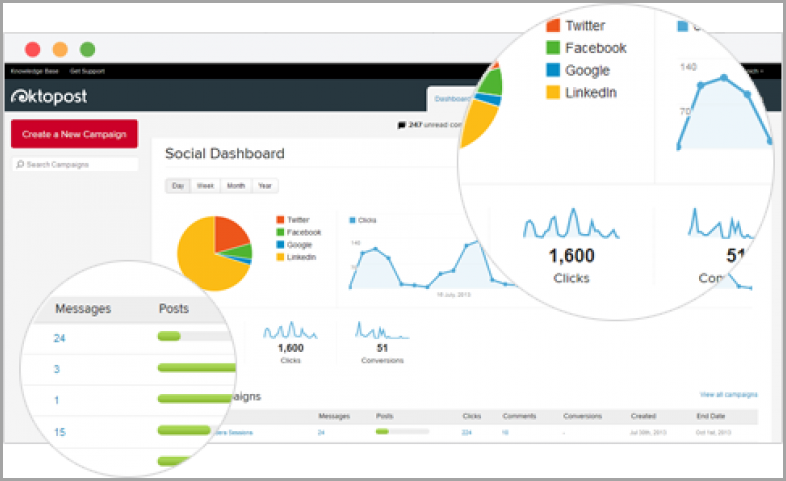 It also integrates with Google Analytics so that you can easily see how your social media and email campaigns are helping you improve your website traffic. Conclusion: Sendible is a pretty good tool that has all the main features you can look for in a social media management tool. The interface is easy to use and it has some cool extra features such as the email and SMS marketing integration. 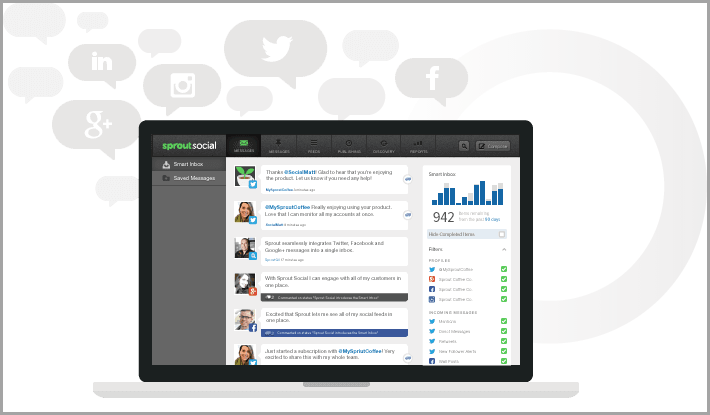 SproutSocial has a very clean, easy-to-use interface. It connects with all of the major social networks: Twitter, Facebook, LinkedIn, Instagram, Facebook and Google+. 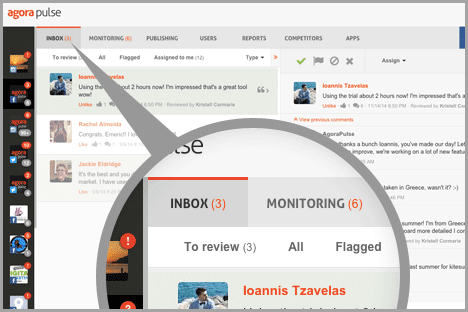 When it comes to engagement, SproutSocial has a feature very similar to one of Agorapulse’s: the Smart Inbox. Just like with the aforementioned tool, SproutSocial’s Smart Inbox gathers all of your social messages in one place that’s easy to manage and make sure you’ve responded to everything that needs your attention. You can schedule posts for all of your accounts from one box (similar to several other tools), which are then placed in a shared content calendar where you and your team can review and edit all of the upcoming updates. You can also get pretty good analytics reports for Twitter, Facebook and Instagram but one of the features that makes it stand out is that you can also review each of your team member’s activity and engagement. Conclusion: SproutSocial is definitely worth a try; the interface is beautiful and intuitive and it has good tools for engaging and scheduling updates. Buffer is a social media management tool designed to help you post more easily to your social networks. It works for both individuals as well as teams that want to collaborate. Buffer is first and foremost a publishing tool that aims to help you increase engagement, reach, clicks and ultimately traffic to your website. It works with Facebook, Twitter, Instagram, Pinterest, Google+ and LinkedIn. You can use Buffer to publish and schedule content, curate your favourite websites and blogs to easily share new content with your followers, see quick analytics for each of your posts and get more detailed analysis with the Business plan. One of Buffer’s best features in my opinion is its integration with Pablo by Buffer. With Pablo, you can more easily create images to share with your audience. This is really useful, as images help increase engagement and traffic. Conclusion: Buffer is a great tool, but mostly for those who are looking to increase their engagement, as it doesn’t have the full suite of features other tools like Agorapulse, Hootsuite or Sendible. As you upgrade to Business or Enterprise plans there are more features, but the prices are also much higher. MavSocial is a social media management tool that allows you to connect your Facebook, Twitter, Tumblr, Youtube and LinkedIn accounts into one central dashboard. 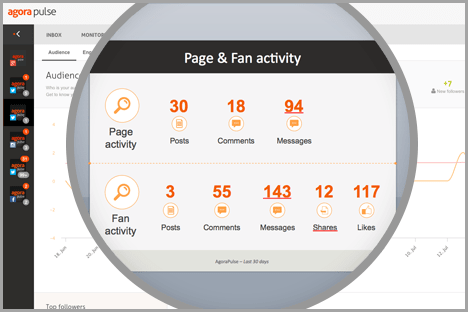 On the main dashboard, you can monitor all of your social networks and the engagement and brand mentions so that you can quickly respond. You can also use it to create and manage social media campaigns and publish and schedule social media posts. MavSocial has its own social inbox where you get all of your mentions, comments and replies from all connected social networks. Similar to Buffer in a way, MavSocial aims to help you post better visual content to your social networks. MavSocial allows you access to a library of over 70 million royalty-free images from sources like Getty Images, Pixabay and more, and you can even edit your photos from within the tool. Conclusion: MavSocial has everything you need from a social media management tool with the added feature of finding and adding images to your posts directly from within the tool. Oktopost stand among all of the other social media marketing tools as it’s dedicated to B2B marketing. That said, its features are similar to most other dashboards. 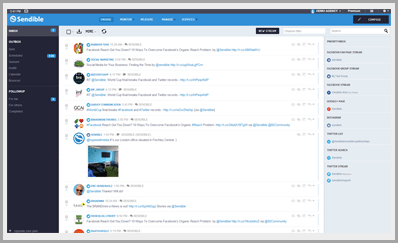 With the menu on the left hand side of the screen and its different streams, Oktopost looks quite similar to the popular Hootsuite. The design is a bit cleaner and sleeker than Hootsuite in my opinion, making for a better browsing experience. You can use Oktopost to easily monitor keywords, mentions of your brand, company pages and more, in a similar way to Hootsuite. 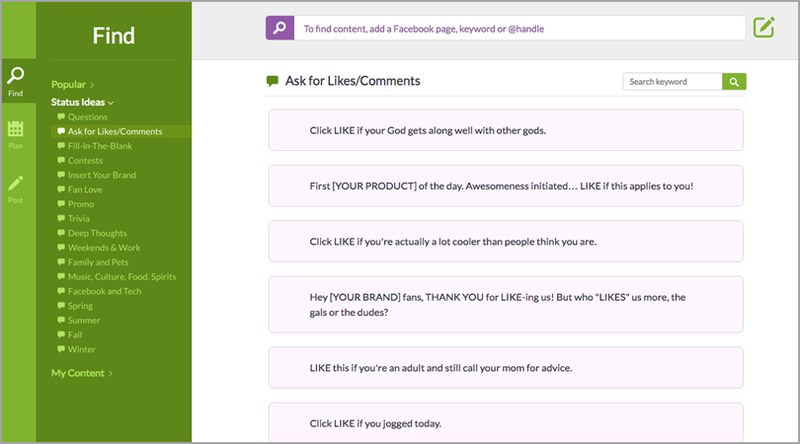 It also has a Social Inbox where you can see every comment from all of your social accounts in one place. 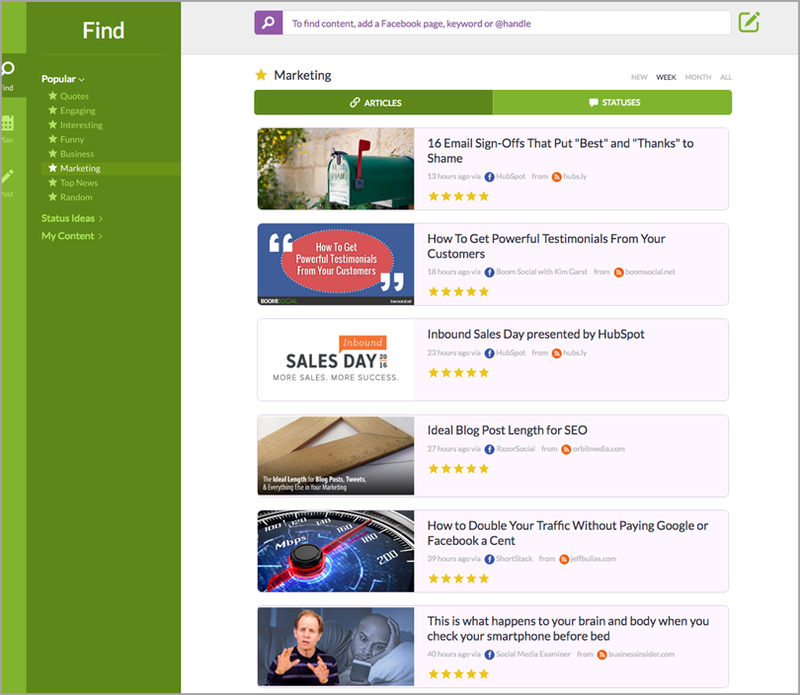 Oktopost helps you post better content to your audiences with their content curation feature. Social Amplification is probably my favourite feature from Oktopost. You can basically make use of your employees in an entirely new way, by helping them become thought leaders and brand advocates for your business. 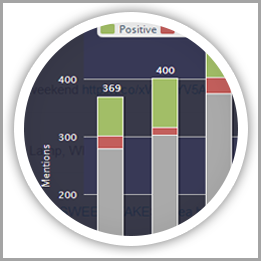 Oktopost also provides detailed analytics and beautiful reports, and helps you track any conversions you make on social media. Conclusion: Overall, Oktopost is a great tool for B2B companies and marketers, as it has most, if not all of the features you need for a complete social media strategy. Tailwind is a social media marketing tool for the visual marketer who uses Instagram and Pinterest. If you’re an avid Pinterest user, this is definitely the perfect tool for you. You can use it to pin content to multiple boards, monitor mentions and conversations, easily drag and drop content in your calendar and create multiple pins from any website with their browser extension. 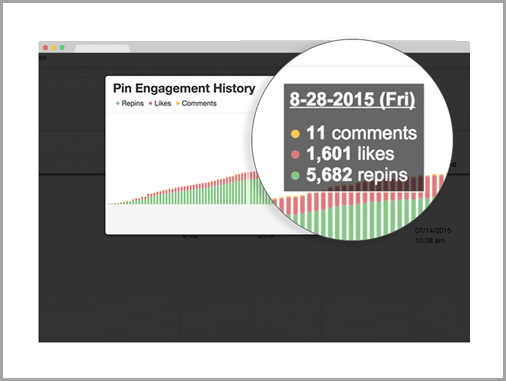 Tailwind also helps post pins better, by automatically optimizing your pinning schedule based on your audience. You also get detailed analytics so you know which content works best and which doesn’t. The Instagram features will be coming soon and Tailwind promise similar features to the Pinterest ones – remains to be seen how well it will work. Conclusion: Tailwind is perfect for Pinterest marketers. However, if you’re using more social networks and your Pinterest strategy isn’t too complex, you can probably do just as well with one of the more full-featured social media marketing tools. Twitter is arguably the best “universal” platform for social media marketing, customer service, increased reach and visibility and for getting more traffic to your website. Social Quant aims to help you get better results from Twitter: more engagement, more targeted followers and increased brand awareness. The way it works is it finds more targeted followers based on the keywords you set so that your following grows with users that are interested in your business and what you have to say. This in turn leads to more engagement, increased brand awareness and more traffic. Conclusion: Social Quant is the perfect tool for those who want more out of their Twitter. It’s especially useful to those who are struggling to get followers or not getting enough engagement, as well as for beginners who want to grow their audience quickly, yet still make sure they are followed by the right people. The G2Crowd and Ian Anderson Gray’s infographic on the top social media marketing tools has found, through detailed customer reviews, that Agorapulse is the best dashboard of 2016. I have to say that I agree, because while there might be other similar tools with the same features, Agorapulse is incredibly intuitive and easy to use and it has a beautiful interface. That said, marketers have different needs and each tool has its pros and cons, so it’s up to you to figure out which one suits your needs best. 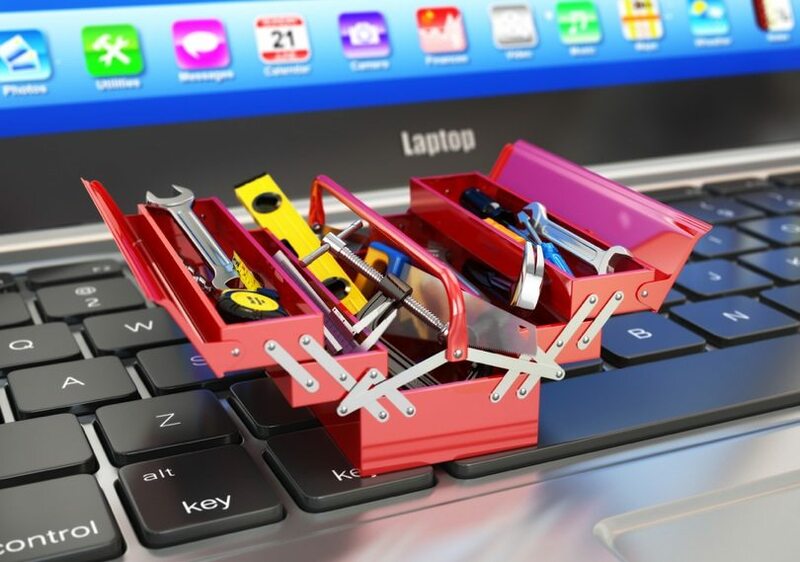 What do you think is the best social media marketing tool? Guest Author: Highly regarded on the world speaker circuit, Lilach Bullock has graced Forbes and Number 10 Downing Street with her presence! She’s a hugely connected and highly influential serial entrepreneur. Listed in Forbes as one of the top 20 women social media power influencers and likewise as one of the top social media power influencers, she is one of the most dynamic personalities in the social media market and was crowned the Social Influencer of Europe by Oracle. A recipient for a Global Women Champions Award (by the Global Connections for Women Foundation) for her outstanding contribution and leadership in business.